A strangers just a friend you haven't met, or so the saying goes. How true this is depends on your definition of friendship. Most of my real life, bump into in the street, have lunch with, dinner party friends know I have a geeky side - how much they know about the extent of it depends on how much attention they pay to Twitter. They'll nod if the topic of video games comes up, they humour me. The conversation is fleeting and typically ends with "I had those when I was a child". this is coupled with a look equal amounts pity & disappointment when they realise a huge amount of my free time is still spent playing with 'children's toys'. I also have online friends, whom I have met on my many years spent on the Internet. Some know me from when I got my SingStar Guinness World Record , some from forums or Facebook groups, others found me from this very blog. Typically we chat over Twitter (please follow me if you don't already) and we don't have to hide our seedy geeky under bellies. These online buddies not only understand when I talk about "Mode 7 whizzy graphics" or "complete in box eBay listings" but they are as enthusiastic about them (more so in some cases). At the risk of sounding like a terrible advert for a lonely hearts website, I might also add that some of these online friends have actually migrated into the realm of the real, becoming off screen pals. Meeting like minded folk was never the intention of my blog which was in essence justification for spending hundreds of pounds on boxed snes games. It has been a nice perk; who doesn't like getting messages from random folk saying they've enjoyed something you have created. Imagine my delight therefore when I got an invitation I simply couldn't decline, the chance to cameo on what is without exaggeration one of my favourite gaming podcasts (and time spent on the tube means I listen to a lot!) 'The RetroGrade Podcast' and my own writing, I like to think approach old games with a similar goal: a light heartedly return to an old games from a modern perspective putting nostalgia on the back burner and shoe-horning in obscure references. I perhaps enjoy the show all the more because I'm a similar age to the hosts and have a comparable gaming backstory. Each show 'The Retrograde Masters' pick a game, all play it and discuss it, ultimately grading it on a ridiculous scale. My role in the podcast was to introduce the game, with all the enthusiasm and whimsy I could manage. This goal was tricky, not because i was shy about talking into a microphone ( I do it all day at work) but because the game picked was one I wasn't particularly enthusiastic about. I'd even go so far as to say I hated Doom for all sorts of reasons. Primarily because first person perspective games literally make me feel sick, they're the only things in the whole world that give me motion sickness. Maybe it's because they are too immersive, my brain thinks I'm in the situation when my body tells me I'm clearly not. My eyes may tell me I'm having a merry old meander through the fires of hell, but how am I when my legs aren't moving? The closer to reality the first person game is the more I suffer. 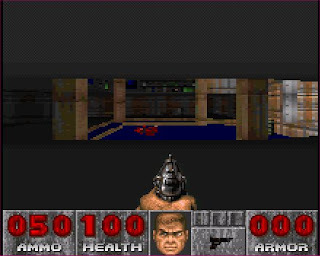 Doom on the Snes though doesn't look too realistic, it's very much the poor relation to most other versions. Even with a turbo injected Super Fx 2 chip on board the cartridge the humble 16bit Nintendo can't keep up without huge compromises. The floor and ceiling textures gone, resolution halved, frame rate reduced and play screen limited. In an article in Super Play, Vince Bracken, the conversions co-manager, discusses that all of these 'revisions' were essential to maintain 22 of the 27 PCs maps and all the boss enemies. disappointed by what the had to settled for. It looks awful to a modern eye, only marginally better than the 3D sections of Jurassic Park and at least in that dinosaur filled game you had a fun overhead Zelda style game to return to, (albeit one with T Rexs and rocket launchers). 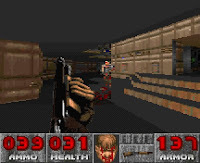 In Doom all you have is the same stroll through dark room after dark room where the only variation is the enemies you face and the colour of the walls. front due to technical limitations. Angry pink bears, ginger bread men and army men with colourful hair, all hell bent on making my little on screen spite face bloodied. The subject matter was controversial at the time, as was the violence. Satanic imagery in a Nintendo game was shocking and the fact that this was all seen from your perspective made the blood lust much more visceral. In typical Nintendo tradition, naturally it a slightly toned down version with a family friendly lack of blood impacts, but there's still some pretty objectionable content. Personally, though I'mnot a fan of excess violence, I am happy for it to exist presuming its consumed by an appropriate audience. If this audience though is modern and seeing Doom for the first time the shock I imagine is muted. Now distilled through an 'out dated' filter it seems almost puerile in its depictions, they are about as offensive as a Halloween episode of the Simpsons. Nowadays FPS games are judged on the strength of their multiplayer, with the solo campaign being little more than an afterthought sometimes. 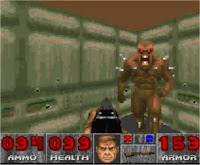 Doom was the pioneer for this, at the time the community was thriving and online multiplay rampant. The snes version however lacks this (unless you bought an Xband modem and lived in the US). The land of the dead is a place you visit alone, even if company would have been preferable as some levels come close to being impossible. 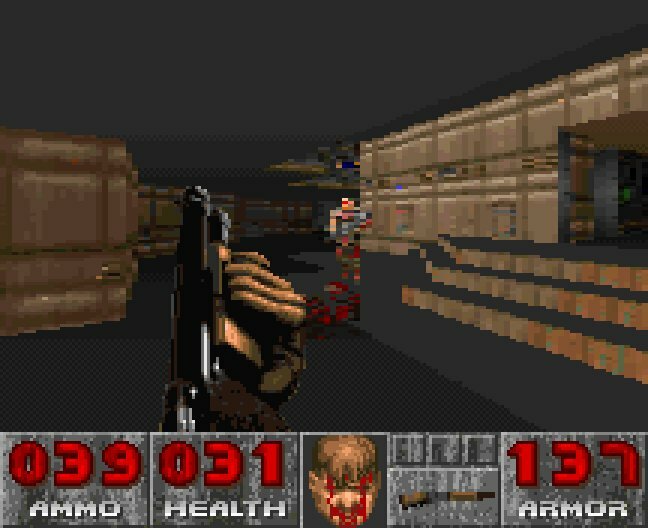 Enemies shooting from all directions may be there to induce fear and shock, but it's just brutally unfair in a game running at 15 frames per second that isn't fast enough for you to return fire. I found myself dying simply because I had no idea where I was being shot from, mainly because you can't turn and strafe at the same time. A lack of battery back up save also meant that each episode had to be finished from begging to end in one sitting. A huge ask from someone who could stomach the violence but not the perspective. 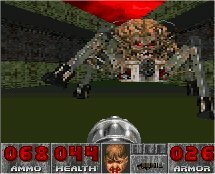 Even if I wasn't dizzier than a 8bit egg in a washing machine, I dare say I would still not have enjoyed returning to Doom. While I can see what it started and appreciated the legacy, the genre it spring boarded has evolved beyond comparison. A blood stained page in history that is best fondly remembered by those who once loved it and avoided by everyone else. Ready your 'ungrateful slapping stick', I was given this as a gift from one the previously mentioned online buddy that has become an offline friend. It was amongst a bundle of games that also included Shadow Run and Mega Man X. In such adored company Doom was never going to compare. I really appreciate the generosity but not every game can be a winner. He can't have it back though, as Doom is in a great condition box (and we all know how much I love a nice box) and its my first non-grey cartridge. No collection is ever complete without a blood red addition after all! I heard about you on The RetroGrade podcast and came here. Really like your writing style, funny but well researched and intelligent. Do you write for websites too or just here? I have a lot of catching up to do.